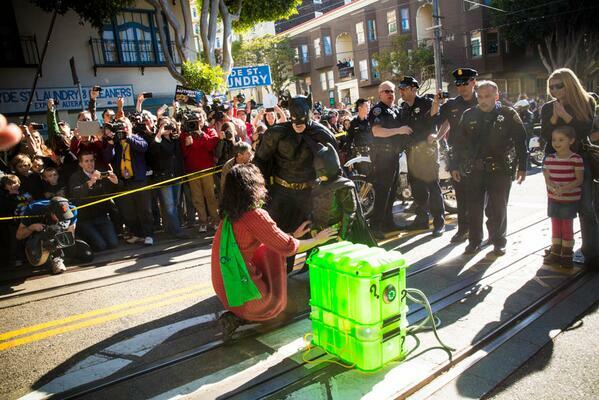 #SFBatkid is blowing up everyone's feeds right now. So basically, thousands of people helped this kid go superhero, save a damsel, and be a hero. Huge crowds gathered in San Francisco today to cheer on Bat Kid, aka Miles, a 5-year-old who is battling cancer, saving Gotham City, and making it rain all over the entire internet's face. Don't believe me? Try to get through all these pictures of the pint-sized crime fighter without breaking down a tiny bit. I'm not crying — you're crying! ALL OF YOU ARE CRYING. Miles has been battling cancer since he before his second birthday, according to the Los Angeles Times. But what he really wanted to do is normal 5-year-old kid stuff. Uh, like be Batman. And so the Make-A-Wish foundation, along with the entire city of San Francisco came together to transform the place into Gotham City.